Recent evolution in the mobile applications market now offers enterprises new opportunities for reaching customers in ways never before possible. In the past 18 months, a number of independent market forces have converged to enable goods-and-services providers to market to specific customers, at specific times, at specific locations. Importantly, such targeted messaging draws on a richer-than-ever set of consumer information, including not only detailed demographics from implicit (inferred) and explicit (user-provided) profiles, but also real-time, location-based data. Mobile devices, namely smart phones, now have sufficient computing power and screen real estate to effectively and conveniently replace laptops a majority of the time. 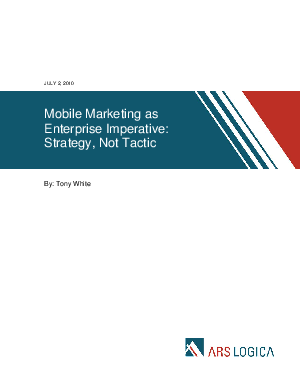 Already, they have become the primary device for e-mail and calendaring1, and as they supplant laptop-based Web clients, built-in GPS capabilities will foster opportunities for achieving competitive advantage via time-and-place aware, native mobile applications. With the right user permissions, organizations can easily use real-time, location based services to enrich the customer experience – and themselves – by a definite, if yet difficult-to-quantify margin.